Sperry Chalet was built in 1913 by James J. and son Louis Hill of the Great Northern Railway, the prime developer of Glacier National Park. Listed as an Historic Landmark, these rustic buildings, built of native rock, have survived their rugged environment relatively unchanged for over 90 years. Opened in 1914 the main buildings consist of a two story hotel building and a kitchen/dining room building. 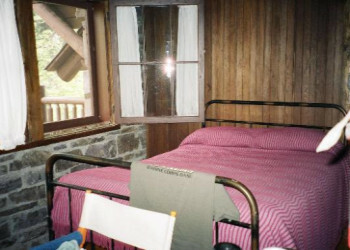 Except for modernized kitchen facilities and the new restroom facility, an effort has been made to keep both the interiors and exteriors of the chalets much as they were built. Meals are informal, table d'hote; dinner is served from 6 to 7 p.m., breakfast served from 7 to 8:30 a.m. A trail lunch is provided or a chalet ala-carte lunch. Ala carte service is available to all in the dining room from 11:30 a.m. to 5 p.m. Breakfast and dinner are available separately with advance notice. 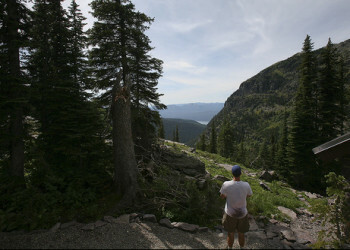 Sperry Chalet is located about seven miles east of Lake McDonald in Glacier National Park in the U.S. state of Montana. The chalet was built in 1914 by the Great Northern Railway and is a National Historic Landmark contributing property, being one of five structures in the Great Northern Railway Buildings National Historic Landmark. 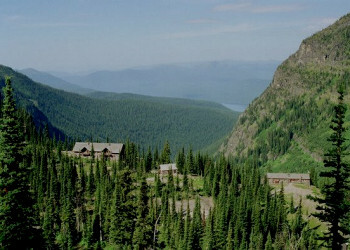 Along with Granite Park Chalet, Sperry Chalet is one of the two remaining backcountry chalets in Glacier National Park. The chalet is reached only by trail, via hiking or horseback. One of the two trails leading to the chalet are the Sperry Trail, which starts at the Lake McDonald Lodge parking lot and stretches 6.7 miles to the chalet, climbing 3200 feet in the process. The trail passes along the base of Mount Brown and over the west ridge of Mount Edwards, with views of U-shaped valleys along the way. A side trip to Sperry Glacier is also possible, being a 3.5 mile hike (7 miles round trip). The other means of accessing the chalet is via the Gunsight Trail, which is a 12.1 mile hike from the Jackson Glacier Overlook on Going-to-the-Sun Road. This hike averages 9 hours, so it is important to plan ahead. The chalet, nestled in a glacial cirque, consists of two buildings from the Great Northern era: a two story hotel building and a kitchen/dining room building. A restroom facility has been added, but is not part of the historic landmark designation. The dormitory building is built with random rubble masonry, providing a feel of architectural ruggedness, and is topped with a large gable roof that has two dormers on either side. The kitchen building is also made of random rubble masonry, but uses smaller stones and appears less striking in its design. The kitchen building is topped with a lower gable roof. Unlike Granite Park Chalet, Sperry Chalet provides meal services: dinner, breakfast, and either a trail lunch or an ala carte lunch in the dining room. The guest rooms are private, but in line with the backcountry experience, there is no electricity, heat, or running water.